Nia Jones (Environmental Geography 2016-) and Douglas Lewns (Environmental Geography 2017-are students at Cardiff’s School of Earth and Ocean Sciences and founders of The No Straw Stand – a campaign to get companies to stop using plastic straws. This year, Nia is serving as Ethical & Environmental Officer at Cardiff University Students’ Union. Plastic straws are used, on average, for just 20 minutes. When they are discarded, they can pollute the environment for hundreds of years. It’s a global issue. Every single day, more than 8 million pieces of plastic make it into the world’s oceans. They get ingested by wildlife and break down into microplastics. Current estimates predict that by 2050 there will be more plastic in our oceans than fish. Plastic straws are one of the top ten sources of marine debris: each year more than 36.4 billion of them will be thrown away in the European Union alone. Studying Environmental Geography, we’ve really come to appreciate the scale of this problem, and the urgency with which action needs to be taken. But environmental issues like this often feel too big to be tackled by individual action. That’s what inspired us to set up The No Straw Stand. It’s an initiative that encourages businesses and organisations to forgo plastic straws in favour of waste-free, sustainable alternatives. Focusing on businesses takes the pressure off individuals, and by helping to persuade businesses to be more environmentally conscious, individuals and communities can feel like they are making a difference. 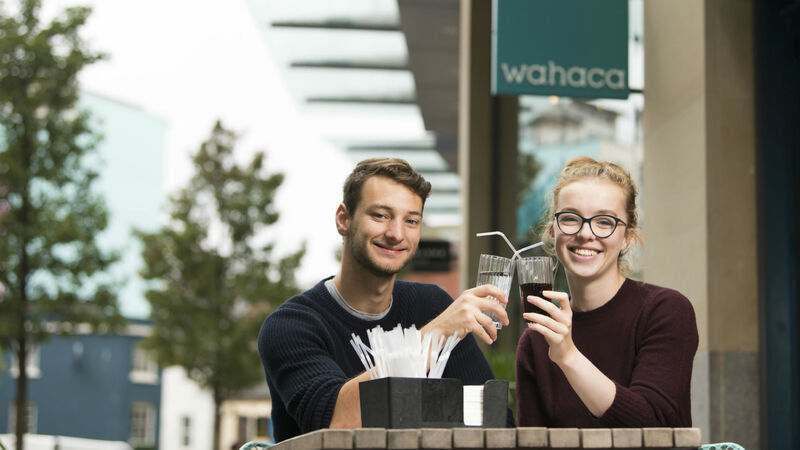 One of our biggest successes so far has been convincing the restaurant chain Wahaca to go plastic-straw free – and they’ve been joined by another 30 businesses. We’re aiming to get even more! Our success has also propelled us into a number of different projects, including Rhiwbina Against Plastic and Plastic Free Penarth. Now we’re liaising with Cardiff Council to introduce environmental scientist and children’s author Ellie Jackson’s book series ‘Wild Tribe Heroes’ into local schools. If we can encourage school children to become the next generation of environmental ambassadors, then we’ll really start to see a difference.